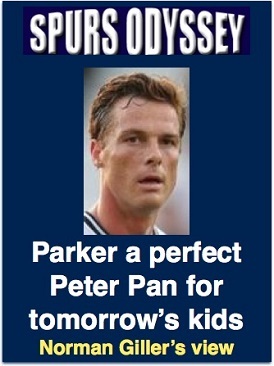 Scott Parker�s return to Tottenham in the role of Under-18s coach and club ambassador filled me with as much pleasure and excitement as if we had signed Lionel Messi. Ok, a slight exaggeration, but we should all be overjoyed to see Scott bringing his knowledge, his enthusiasm and his talent to pass on to the next generation of Lilywhites. My congratulations to head of development John McDermott on persuading Scott to start his new career as a guru for the Tottenham youngsters, and, of course, well done Mauricio Pochettino in rubber-stamping the imaginative appointment. I remember Harry Redknapp telling me yonks ago that Scotty was a born leader, a dressing-room motivator and eaten up with tactical thoughts and theories. That�s why he brought the creative midfielder to Tottenham in the first place. Now Scott can pass on his positive philosophy like a relay baton to the Tottenham Academy boys, who could not have a better role model on how to conduct themselves on and off the pitch. He is the perfect Peter Pan for tomorrow�s kids. Down the line, I am convinced 36-year-old Parker will develop into a fine young manager, but meantime his tutoring could not be better placed. Warmed by Parker�s return, let�s get further goosebumps by focusing on Part Five of our visit back to the greatest season in Tottenham�s history, the remarkable record-breaking Double year of 1960-61. On the 50th anniversary of the FA Cup victory over Leicester at Wembley, I combined with entrepreneur and life-long Spurs supporter Terry Baker to produce a limited edition book of the Golden Double, that was introduced and autographed by Braveheart Dave Mackay. THE record-breaking unbeaten run was finally torpedoed by a Sheffield Wednesday team lying in second place. It has been lost in the mists and myths of time that the previous season Tottenham had got off to a 12-match unbeaten start on their way to finishing third in the table. The run had ended at Hillsborough, so history was painfully repeating itself. Hillsborough has never been a happy hunting ground for Spurs, who had not won there since back in the 1937-38 season. Wednesday, protecting a 100 per cent unbeaten home record, snatched the lead through Billy Griffin just moments after Les Allen had what seemed a certain goal brilliantly saved by goalkeeper Roy McLaren. Two minutes later, and with half-time beckoning, Dave Mackay took a quick free-kick and Maurice Norman galloped into the penalty area to head an equaliser. Both teams played flat out in a see-sawing second-half, and after several near misses by the Spurs forwards the vital winning goal was collected by Wednesday�s Johnny Fantham. He thumped the loose ball home after a comedy of errors in the packed Tottenham penalty area. Dave Mackay played like a man possessed as he tore around the pitch trying to lift Tottenham into a comeback, but the Wednesday defence held out under a non-stop bombardment. It was rough and it was tough, but players from both sides went off with linked arms as a sporting finale to a memorable duel. FREE from the pressure of HAVING to win, Spurs relaxed and started to play with their natural fluency and finesse. They purred to a 5-2 victory over Dinamo Tbilisi in a prestige friendly on the Monday and then, five days later, buried Birmingham under an avalanche of goals. Les Allen was the man of the match, but his name does not appear on the scoresheet. The player better known for his goal scoring turned schemer and had a hand � or rather, a well-directed foot � in three of the goals. The game was all over as a contest inside the first 17 minutes. John White ended a sweeping three-man movement with goal number one after just 130 seconds. Allen took three defenders out of contention six minutes later with a darting run before releasing the ball for Terry Dyson to make it 2-0. The energetic Allen and Bobby Smith exchanged passes to create an opening for Cliff Jones to score in the 16th minute. Birmingham were rushed off their feet trying to hold back the flood of Tottenham attacks, and cracked in the last 20 minutes. They conceded a headed goal by Jones, then a Smith penalty after Allen had been brought down. Dyson finished off the slaughter with a tap-in goal from close range after Birmingham�s defence had been turned inside out by a series of beautifully composed raids. The Spurs fans went home singing. They had witnessed 11 goals at The Lane in the last five days. TOTTENHAM continued their war on the Midlands clubs by beating a well-organised West Brom team at home, a victory that increased their runaway lead at the top of the First Division to an extraordinary nine points (this, of course, in the days of two points for a win). And it was still November! Their nearest rivals, Everton and Sheffield Wednesday, both slipped up in what was becoming a despairing chase. West Brom appealed with some justification that Bobby Smith was off-side as he accepted a pass from Cliff Jones before lashing the ball home to give Tottenham the lead in the 21st minute. The referee waved aside the Albion protests, and they were still grumbling when Smith added a second goal after a rapid four-man movement left their defence in a tormented tangle. The ball travelled the length of the Hawthorns pitch on a conveyor belt of passes from Tottenham�s goalmouth for goal number three, neatly tucked away by Les Allen from close range. Right-back Don Howe, England�s No 2 and later a coach and the brains behind the Arsenal Double of 1970-71, pulled a goal back for West Brom before half-time, but hard as they tried they could not pierce the Tottenham defence in a slog of a second-half. Defending League champions Burnley were determined not to let their crown go without a fight, and they produced a proud, passionate performance in this eight-goal classic on a soaking-wet White Hart Lane pitch. Driven from midfield by Jimmy McIlroy � Danny Blanchflower�s Northern Ireland team-mate and best friend � the Lancastrians might easily have been two goals clear in the opening minutes with kinder luck and better finishing. A three-goal burst in a four-minute spell by Tottenham would have killed off most teams. Maurice Norman sparked the quick-fire goal storm in the 18th minute with a firm header from a corner, followed by Cliff Jones finding the net twice in just over a minute as he tortured the usually sound Burnley defence. It all seemed just a question of how many goals could Tottenham score when Dave Mackay made it 4-0 in the 36th minute to send the champions reeling on the mudheap of a pitch. England winger John Connelly pulled one back before half-time, yet few people gave Burnley a hope of getting back into the game. But they had not won the championship without showing great character to go with their class, and rare mistakes by, first Ron Henry, and then Norman let Jimmy Robson and Ray Pointer in for unexpected goals. Spurs responded with an all-out assault on the Burnley goal, but left themselves open for a counter attack and it was John Connelly who finished the scoring spree after exchanging passes with Robson in the 78th minute. Both teams were given a standing ovation at the final whistle. Goalscorers: Norman, Jones (2), Mackay. Appalling December weather kept the Deepdale attendance down to under 22,000 spectators, the lowest crowd that Spurs attracted all season. There was a mood of doom and gloom at once-Proud Preston, who were 18th in the table and struggling against the threat of relegation.The downbeat atmosphere seemed to creep into Tottenham�s usual poise and purpose, and they struggled to gain control. Manager Bill Nicholson was forced to make a rare team change when Bobby Smith reported that he was feeling unwell, and the willing youngster Frank Saul was summoned to once again fill the No 9 shirt. Without their top scorer, Tottenham lacked their usual finishing punch and the Three Musketeers in midfield � Danny Blanchflower, John White and Dave Mackay � were not functioning with the dynamic drive that had made them the talk of football. The treacherous pitch surface made every step a challenge, but the Tottenham defence was rarely under serious threat from a Preston team lacking in ideas and inspiration. How they were missing the recently retired Tom Finney. A far from satisfactory victory was finally clinched when Maurice Norman made his usual run upfield for a corner. He headed the ball down and John White was first to react in a crowded goalmouth and he squeezed the ball into the net to put Tottenham on the way to their first 1-0 victory of the season. TEAM AND SCORERS: Brown, Baker, Henry; Blanchflower, Norman, Mackay; Jones, White, Saul, Allen, Dyson. No too many of the Spurs supporters who made the long trek to Goodison for the match against second-placed Everton could tell you too much in detail about an outstanding win. A curtain of fog dropped on Merseyside and visibility was seriously affected. Scottish schemer Bobby Collins, small but dynamic, was challenging Blanchflower and White for midfield supremacy, and he had the better of the early exchanges. He set up three chances in the opening minutes that were all squandered by his team-mates. The game started to swing Tottenham�s way when Dave Mackay switched from the left to the right side of midfield to stifle the influence of Collins. This released Blanchflower to play his natural attacking game and he was the instigator of two goals in four minutes, first putting Cliff Jones clear to create a goal for John White and then combining with White and Terry Dyson to open the way for Dyson to make it 2-0. Everton could not believe that they were trailing by two goals in a match they had been monopolising, and they opened the second-half as they had the first, with a barrage of attacks. At the peak of their pressure Alex �The Golden Vision� Young and flying Irish winger Billy Bingham set up Frank Wignall for a goal from close range. The fog was almost heavy enough to cause an abandonment when Dave Mackay settled where the points were going with a spectacular 35 yard left-foot drive into the top corner of the net. Few people in the ground saw it, including Everton goalkeeper Albert Dunlop. Last week I asked: Which Surrey-born player started his career with Wimbledon in 1988, won 13 of his 28 Scottish international caps while with Tottenham and later played for Chelsea and Leeds? Most of you were correct in naming Neil Sullivan, the goalkeeper who was the last line of defence for Tottenham between the reigns of Ian Walker and Paul Robinson. Neil will always reluctantly feature in replays of the famous David Beckham goal from the halfway line against Crystal Palace. First name drawn from the correct answers was London-born Greg Hart, who has followed the fortunes of Tottenham for more than 40 years from far-off Christchurch in New Zealand. I will send Greg a screen version of my Spurs �67 book (you might consider buying a signed copy from me at http://www.normangillerbooks.com � all profits to the Tottenham Tribute Trust to help our old heroes). This week�s teaser: Which French-born defender played exactly 200 League and cup games for Spurs between 2006 and 2015, and made his 24th and last international appearance in the 2014 World Cup finals � but not playing for the country of his birth? Email your answer please to SOQLTeaser9@normangillerbooks.com. Closing date: midnight this Friday. I will send a screen version of Spurs �67 to the first name drawn from the correct answers.